MEXICO CITY -- Canada, the United States and Mexico are likely to reach a basic accord over reworking the North American Free Trade Agreement by the middle of next year, the head of the biggest U.S. business lobby group said Sunday. The future of the deal binding the three nations has been in doubt since Donald Trump won the U.S. presidency in November pledging to ditch it if he could not rework terms in favor of the United States, clouding the outlook for Mexico in particular. 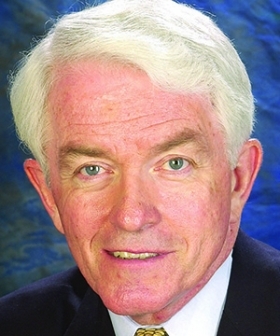 However, Thomas Donohue, CEO of the U.S. Chamber of Commerce, said that he believed business leaders and policymakers were increasingly aware of the need to get a new deal and move on without disrupting business. "We're not going to be fooling around with this deal in 2018," he said in an interview with Reuters on a visit to Mexico City where he will meet policymakers and make the case for free trade. Trump contends that Mexico's growth as a manufacturing power since NAFTA took effect in 1994 has cost jobs in the United States. However, defenders of the deal say it has benefited all three nations and helped American firms compete globally. The U.S. government has yet to send a letter telling Congress that it intends to launch NAFTA negotiations in 90 days -- the notification period required under the fast-track process -- so the potential start of talks is now drifting into August. Donohue said that step should follow in the next few weeks, adding neither Trump nor U.S. companies had an interest in dragging out the NAFTA talks because of the economic damage it would do. "[Trump] is looking at how to get things done," he added. "And I can tell you that he wants to speed this thing up." "Yes. That's my opinion. That's my view. The bottom line is we need to move forward on this deal. It is critical to our economic and geopolitical well-being. Period." Mexico, which sends 80 per cent of its exports to the United States, will hold its next presidential election in July next year. President Enrique Pena Nieto's government is hoping to wrap up the NAFTA talks before it takes place. During his own campaign, Trump threatened to slap hefty tariffs on Mexican-made goods, including a 35 per cent tax on cars, and he caused dismay in Mexico with a pledge to build a southern border wall to keep out illegal immigrants. Since taking office, Trump's tone has softened, though he again railed against NAFTA over the past week and returned to the issue of the wall, saying Mexico would pay for it "eventually." Trump and Congress have both said goods, including vehicles, could also be subject to some sort of border tax. Trump has also recently redirected some of his ire toward Canada, but it's more about dairy and softwood lumber. Nevertheless, Donohue said understanding was growing over the need for a deal that would accelerate, not reduce trade, and argued the prospect of punitive tariffs was receding. "In fact, we haven't heard of that in a long time," he said. "Because if a country were to put a 35 per cent tariff on products moving into their country, the guys you're trading with are going to do it the next morning."